The Whale Galaxy is a barred spiral galaxy in the constellation Canes Venatici. NGC 4631 has been given the nickname “The Whale Galaxy” thanks to it’s wedge-like shape that resembles a whale. This galaxy lies 25 million light years from Earth, and is a similar size to our own Milky Way Galaxy. The Whale Galaxy contains interesting star-forming regions throughout, and has a bright elliptical companion galaxy above its core (NGC 4627). 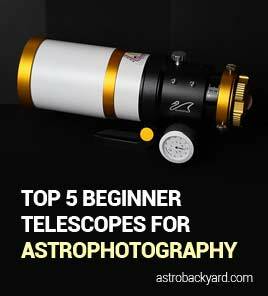 With the right focal length, it makes for an excellent astrophotography target for your camera and telescope. 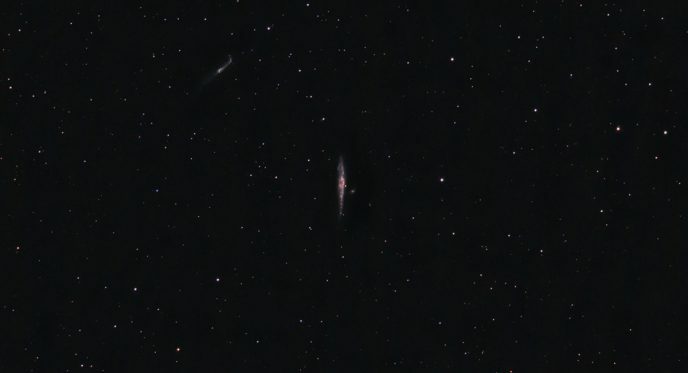 NGC 4631 – The Whale Galaxy in Canes Venatici. To photograph this galaxy, I attached a dedicated astronomy camera to my refractor telescope. 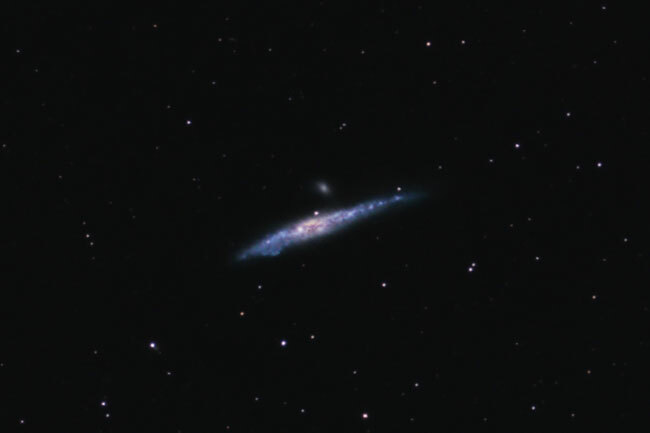 I was able to collect long exposure (5-minute) images of this galaxy thanks to the computerized equatorial mount (Sky-Watcher HEQ5) my telescope was mounted to. 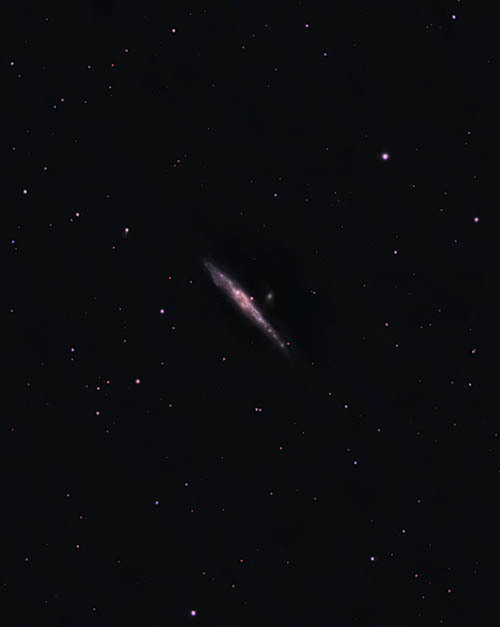 In April 2017, I captured my latest version of the Whale Galaxy using an ASI071MC-Cool CCD Camera and my Explore Scientific ED102. I also tried out Astro Photography Tool for the first time and was extremely happy with the results. The version of the image shown in the video below includes over 5 hours worth of total integrated exposure time. These were shot over the course of two nights (April 23, 24) and were stacked and processed using my standard deep sky workflow. This is one of the highest quality deep sky astrophotography images I have taken to date. The cooled sensor in the ZWO camera provided virtually noise-free images. View the full resolution version on AstroBin. Below, you will find my previous version of NGC 4631, using a smaller telescope and DSLR Camera. If you own an 80mm refractor telescope, you can expect similar results using a modified DSLR camera. This was a project I worked on over several nights in May 2016. I began by shooting short exposures during the waning gibbous moon phase, capturing light frames with heavy moon glow. As the days went on, and clear nights continued, my exposure time increased. This is the result of almost 4 hours of exposure. It was actually quite an enjoyable experiment to add an extra hour at a time, stack the data and process. 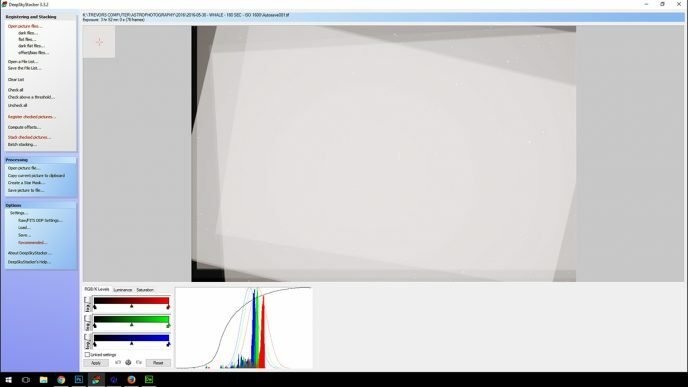 Frame after frame, the signal to noise ratio improved, and the details of the galaxy emerged. Imaged: May 24, 26, 30, 31. Clearly (pardon the pun!) 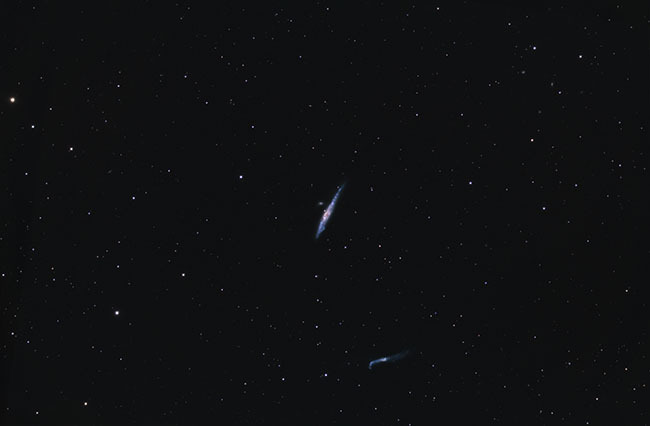 I had a long stretch of clear nights, allowing me to re-visit the Whale galaxy night after night with my DSLR and telescope. It’s times like this when I wish I had a backyard observatory, rather than setting everything up and tearing down every time. At my current property, it is unlikely that I will build a permanent pier to mount my telescope. The light pollution is just too severe to begin construction of a small roll-off roof observatory. I’ll save that dream for another time, and some darker skies. Have a look at the frame rotation between each imaging session. If you couldn’t tell, I did not use any plate-solving software during this project. I have heard good things about Astro Tortilla! The most challenging aspect of processing this image was not the galaxies small size, it was the large area of black space in the frame. When you photograph a deep-sky object containing large areas of empty black space you must pay special attention to noise reduction and gradients. 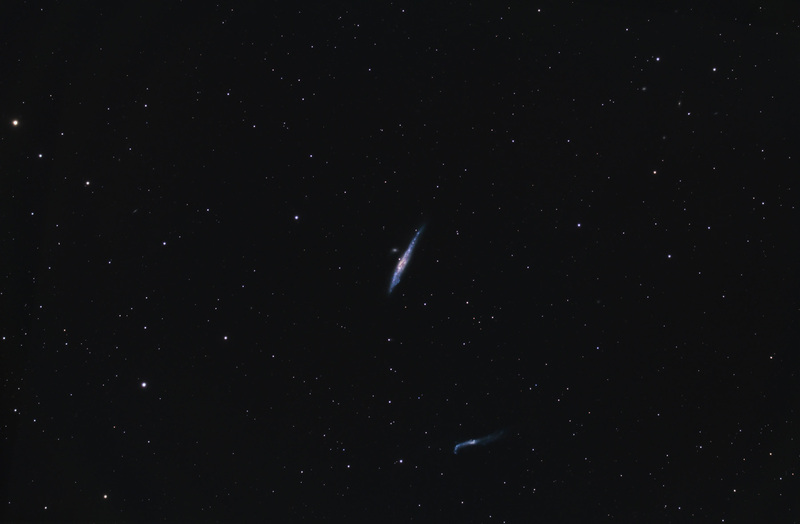 Gradients and vignetting are major issues to tackle when imaging from my light polluted backyard in the city. Even though the signal to noise ratio improved as I stacked more exposures together, a heavy gradient with wavy discoloration remained throughout the image. Once again, the Gradient Xterminator plugin for Adobe Photoshop was a life saver. I personally enjoy images with small, colorful stars. This can be tough to master, as the initial curve stretch alone can brighten and bloat the stars in your image. This was a common trait of my early astrophotography images. The problem was, I focused entirely on the deep-sky object and completed disregarded the expanding stars around it. These days, I use a layer mask to protect the stretching of the DSO from the background. This way, I am able to boost the levels of an object (such as the Whale galaxy) and leave the size of the stars alone. I also run 1 or 2 applications of the Make stars smaller action within the Astronomy Tools action set. NGC 4631 is an edge-on galaxy similar in size to our own Milky Way, located in the constellation Canes Venatici. The Whale Galaxy has a small, yet bright, companion galaxy classified as NGC 4627 near its core. This galaxy is difficult to observe visually in small telescopes as I experienced first hand! 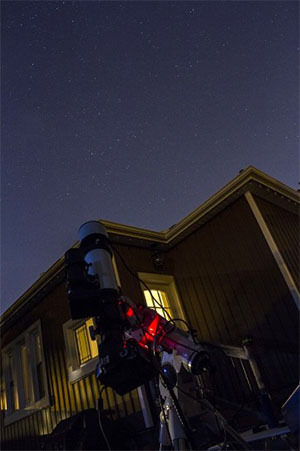 This interested deep-sky object has been well photographed by amateur and professional astronomers alike. I’d be interested to see someone image the Whale galaxy using a larger instrument such an SCT or large Newtonian Reflector. 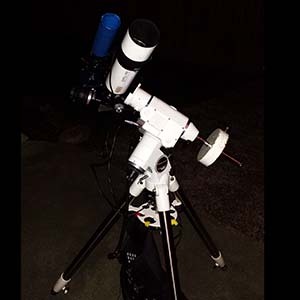 My telescope is always a reliable choice for a wide field view!